WWE is ready to make its return to the middle east this May in continuation of their deal with Saudi Arabia. The WWE is ready to make their return to The Kingdom of Saudi Arabia. Fightful is reporting that WWE will return to the middle east on May 3rd for yet another big live event. The show will be WWE’s third after agreeing to a ten-year partnership with the country’s Saudi General Sports Authority. This was first reported by Dave Meltzer of Wrestling Observer Newsletter back in December. WWE will return in May, with another show expected to take place again this year in November. WWE has not announced the event publicly as of this writing. Meltzer’s report in December noted that the company will likely avoid doing so as long as possible. Especially after the backlash they received for going through with Crown Jewel in November, following the murder of Saudi journalist Jamal Khashoggi. There was speculation that Saudi Arabian Crown Prince Mohammed bin Salman played a role in Mr. Khasshoggi’s death. Several United States Senators suggested WWE pull out of the event, along with criticisms from late night TV hosts. However, WWE continued on with their plans, despite stars such as John Cena and Daniel Bryan refusing to work the show. 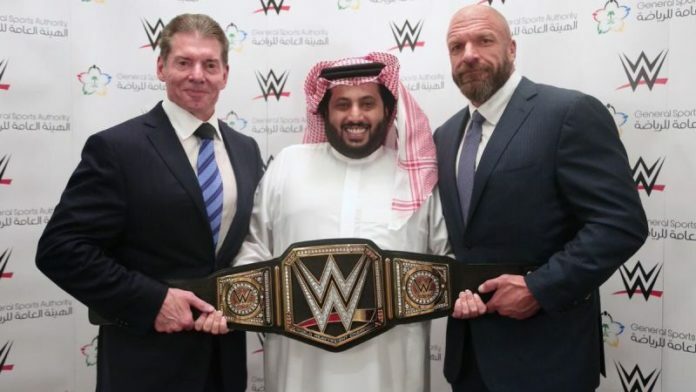 What do you think about the WWE returning to Saudi Arabia in May?